U.S. Border Patrol agents on Monday announced the beginning of construction on the "big, beautiful wall" that President Donald Trump promised to build on the southern border. SANTA TERESA, N.M. — A groundbreaking Monday for a new border barrier in New Mexico signals the beginning of the fulfillment of President Donald Trump’s best-known campaign promise, federal officials said. The project will include 20 miles of new bollard-style wall up to 30 feet tall, including 5 feet of climb-resistant material, Hull said. The new barrier will extend west from Santa Teresa, New Mexico — a town located about 13 miles northwest of El Paso — and will replace shorter vehicle barriers, which agents said are not effective in deterring illegal crossers or drug smuggling. Agents in the sector, which includes El Paso and Hudpseth counties in Texas and all of New Mexico, said new construction will also begin soon in parts of Texas’ Rio Grande Valley, Arizona and San Diego. Hull said the new construction was mandated by the president’s January 2017 executive order on immigration and will take about a year to complete. The 20 miles of barrier will cost more than $73 million, which will come from 2017 Department of Homeland Security funding. Hull said the Santa Teresa area was chosen for the initial groundbreaking because it's one of the busiest crossing points in the sector. In fiscal year 2017, agents apprehended more than 25,000 undocumented immigrants and seized more than 34,000 pounds of marijuana and 140 pounds of cocaine throughout the sector. Agents also reported being assaulted 54 times during that fiscal year. "The president has set the standard for us. And the standard is operational control," Hull said. 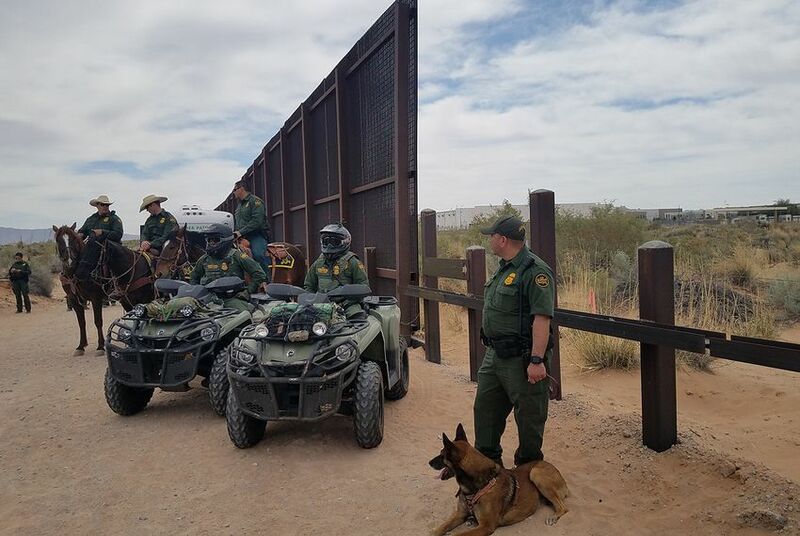 "Operational control means our ability to detect, deter and deny illegal entry, maintain situational awareness and provide the appropriate law enforcement response." Hull also told reporters that he and his agents met with units of the National Guard that will be deployed to the border. Trump ordered National Guard units to reinforce the Border Patrol last week. “We’re nowhere near deploying yet but we have conducted initial outreach with both the New Mexico National Guard and the Texas National Guard,” he said. Monday’s press event came the same day that an environmental group announced they are appealing a federal district court’s ruling that allowed the administration to move forward with border wall construction. The Center for Biological Diversity sued the administration last year, alleging the Department of Homeland Security illegally waived several environmental laws in order to fast-track the wall’s construction. Federal District Judge Gonzalo Curiel ruled in favor of the administration in March.